Short listing feasting options for a trip to Melbourne was challenging. I narrowed down a wish list of 30+ to a handful. Rosa’s Kitchen made it on the basis of their reputation for turning simple, local ingredients into magical authentic Italian fare. It’s not a fine dining Italian – but rather a return time and time again kind of place. 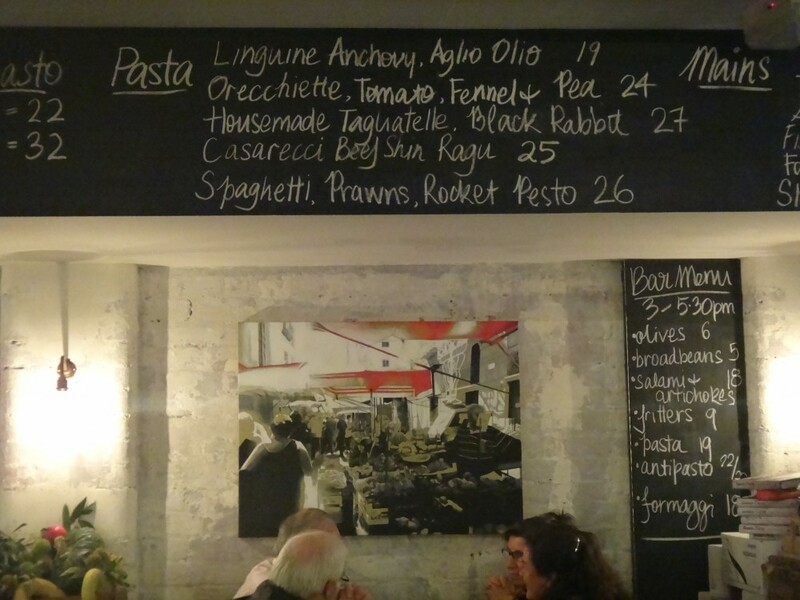 Rosa Mitchell brings her Sicilian roots to Mebourne’s CBD after a few years operating Rosa’s Kitchen in Williamstown. For her CBD laneway venture Rosa teamed up with Peter Mackintosh, David Bartholomew and Chef Lucy David (bringing experience from Coda, Movida Group and Pei Modern). 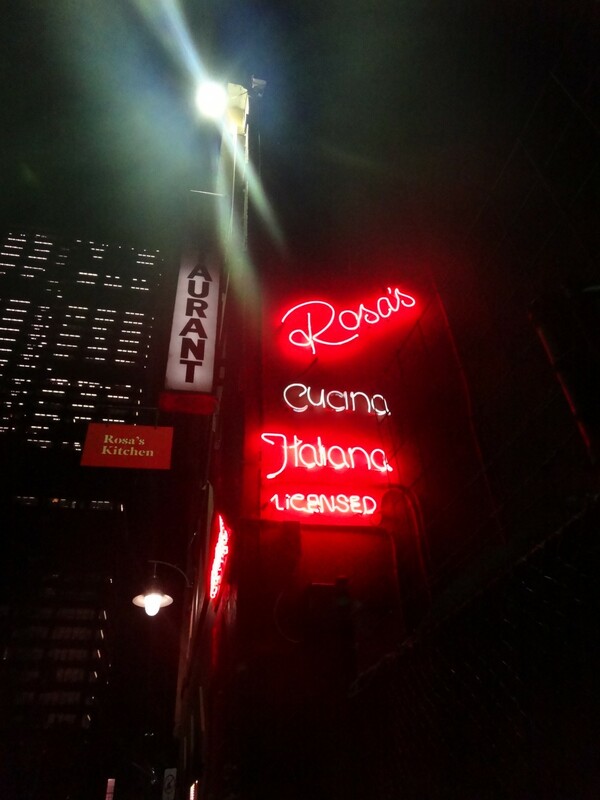 You’ll find Rosa’s Kitchen tucked away on Punch Lane, where you’re welcomed in by a neon sign, a legacy from the previous ‘Cucina Italiana’ that occupied the spot. Inside the feel is cosy, despite its stripped back, verging on industrial decor, with colourful chairs and XL light bulbs. 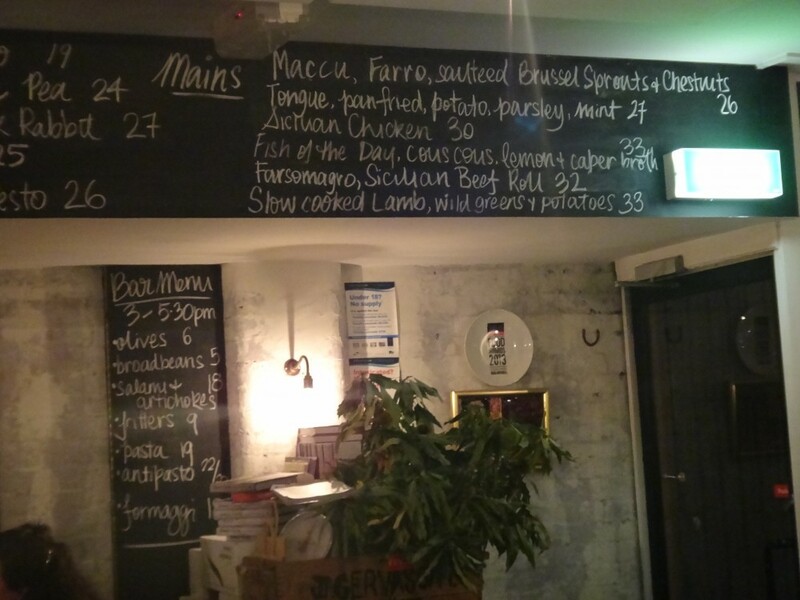 Blackboard menus run high along the wall on each side of the room, with the menu repeated on both sides. So, whether you pull up a bar stool at a high bench or opt for table seating, you’ll have a view of the delights on offer without a strained neck. From what I gathered the floor is managed by Bianca, who brings years of experience to Rosa’s. The service, like the food, is homely and welcoming. I loved that Bianca encouraged us to order main dishes to share, and said that we didn’t have to order everything in one go. Your choice of vino is constrained in a good way – because the short list with a strong Italian (and Sicilian) focus gives you little excuse to order anything but Italian. 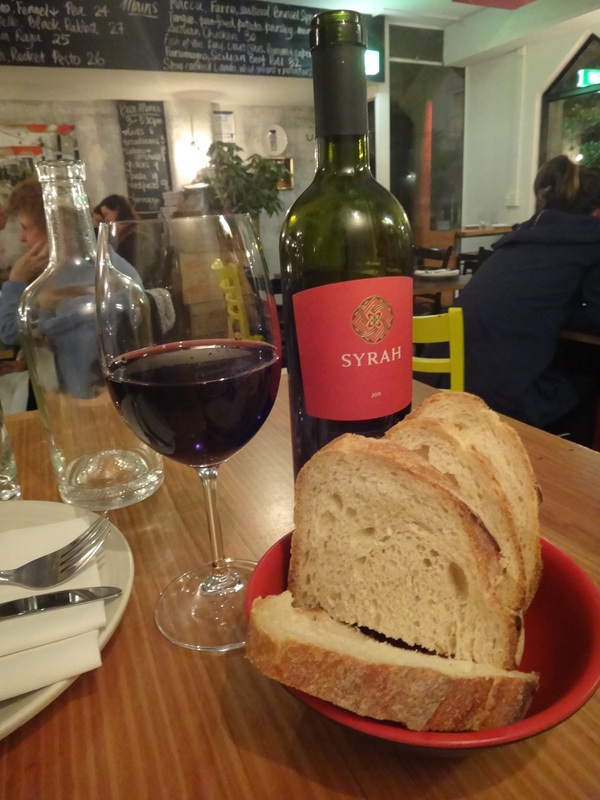 Without deliberation I chose a bottle of Syrah from Sicily. The menu includes an antipasto plate (in two sizes at $22 and $32), a few pasta dishes, mains and dolce. The menu changes regularly to take advantage of local and seasonal produce, including produce from Rosa’s farm near Yandoit in Central Victoria. A small antipasto plate, with complimentary bread, was just enough to start and allowed time for plenty of deliberation over the blackboard menu. Most home cooks can whip up a good antipasto plate. I mean you could argue it’s all about good produce and presentation. But once you’ve tried Rosa’s antipasto you’ll think differently. Each element felt like it had its own story – with a recipe that had been adapted and perfected over many years. 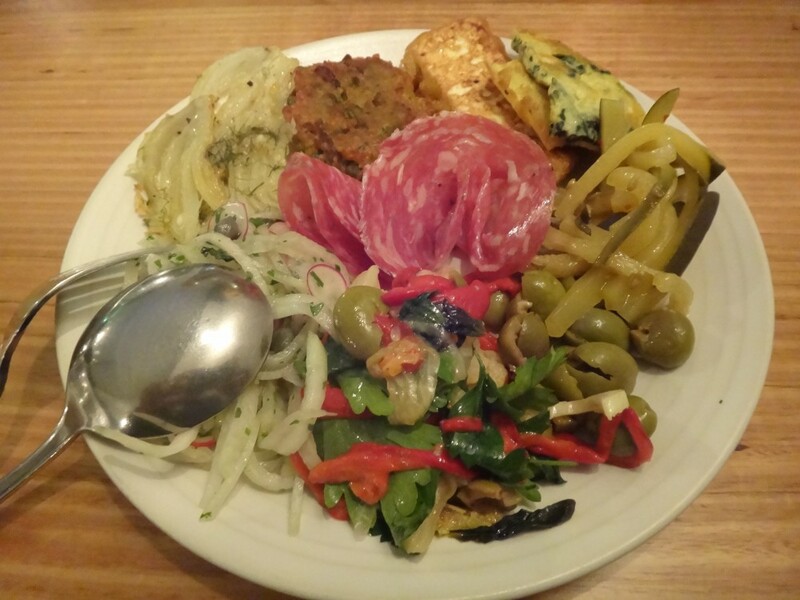 Our platter included frittata, slices of salami, marinated olives and artichokes, a parsley, pepper and caper salad, haloumi and more. I can’t promise you’ll enjoy the same antipasto that I did – because, in keeping with seasonal cooking, it changes regularly. More dishes followed, each shared one at a time. 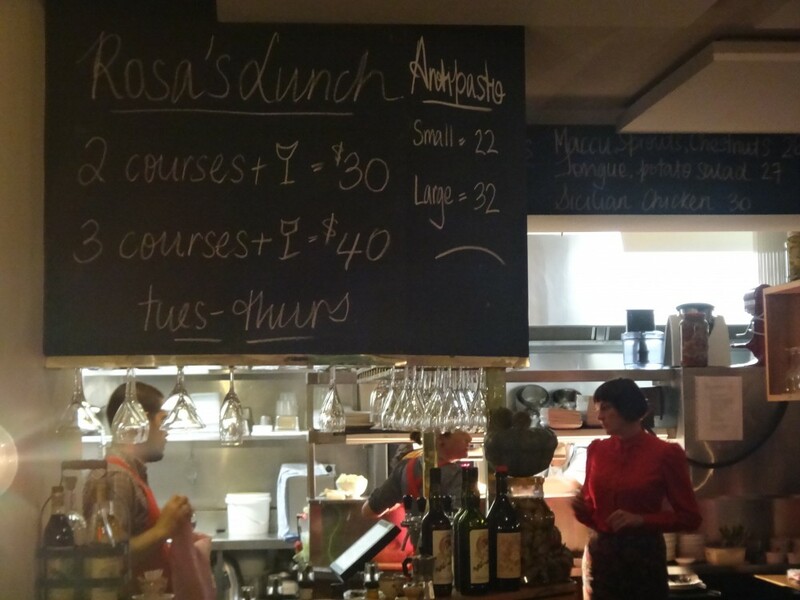 All of them lived up to Rosa’s promise of food that’s ‘simple, traditional, lovingly prepared and authentic’. Here’s more about each one. The pasta was light and fresh, with an ample amount of peas and a sweet and light tomato sauce. My carnivore dining partner would’ve preferred the beef shin ragu but the orecchiette allowed me to justify the meat feast to come. And the serving size was just right too, not too little and not too much. The decision here wasn’t because I have a love of offal (apart from perhaps a smooth chicken liver pate). Rather it was based on a recommendation from Bianca. How is it? 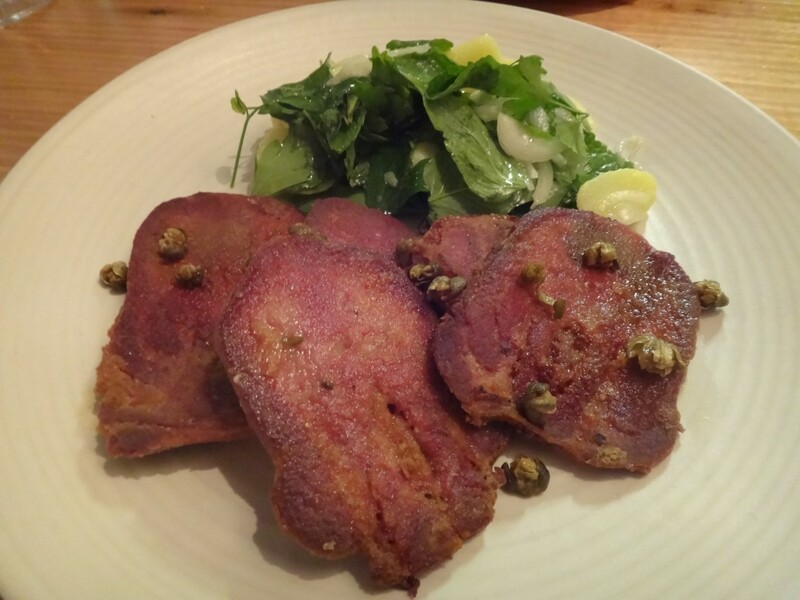 The beef tongue is served in several slices and tastes crispy on the outside and tender to chew, not too dissimilar to corned beef. Put it this way I was pleased to have ticked tongue off my ‘tried it’ list. If, like me, you’re experimental then it’s always worth trying ‘out of the ordinary dishes’ when you trust the chef’s careful sourcing of produce (rather than perhaps a back street in Bangkok or Shanghai). If my days on Earth were numbered I’d be feasting daily on lamb shoulder. So it’s no surprise that I tried Rosa’s version. 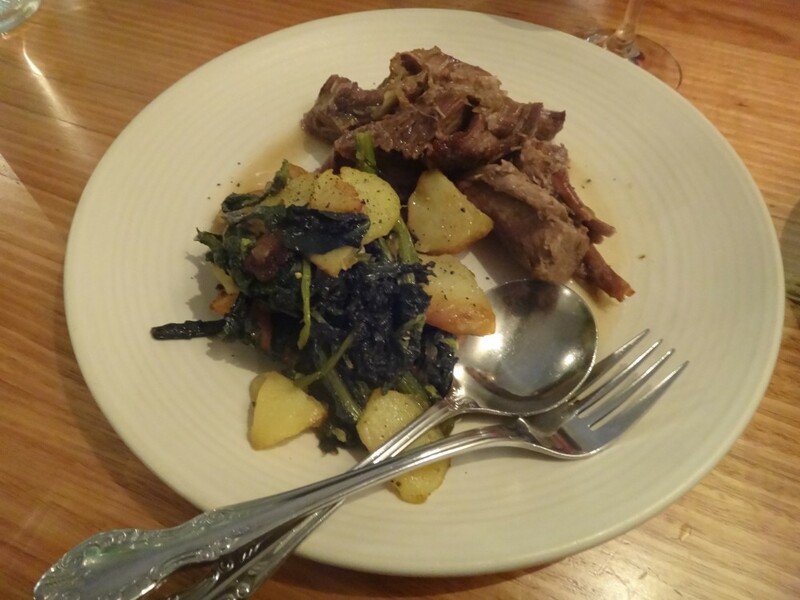 A generous serving of lamb comes with potatoes and wild greens. The surprise is the iceberg lettuce as an accompaniment. The crispness complements the lamb and I’ll be trying this at home the next time I slow cook a lamb shoulder (recipe here). Although tempted by a sweet Italian dessert the generous portions and a bottomless bread basket had left me wishing I hadn’t worn such skinny jeans. Before leaving I had the pleasure of meeting Rosa herself who’d been busy in the kitchen. She popped over for a brief hello and I picked her brains on her lamb shoulder secrets. I’d love to have her to myself in my kitchen for an afternoon. Rosa’s Kitchen promises simple, traditional, lovingly prepared and authentic dishes. Rosa and her team deliver on this and more with an experience that (if you love Italy as much as I do) will momentarily transport you to Sicily. I hoped it would be a return every couple of months kind of place. Is it? Let’s just say if I was a Melbournian I’d keep going back, because for me at least with familiarity comes love when it comes to a good Italian. Order bar snacks from 3pm to 5.30pm – including many of the items on Rosa’s famous antipasto. Tuesday to Thursday at lunch enjoy two courses for only $30 or three for $40 (iwith a glass of wine). Bomba, City Wine Shop and Madame Brussels are all close by for pre or post dinner drinks. 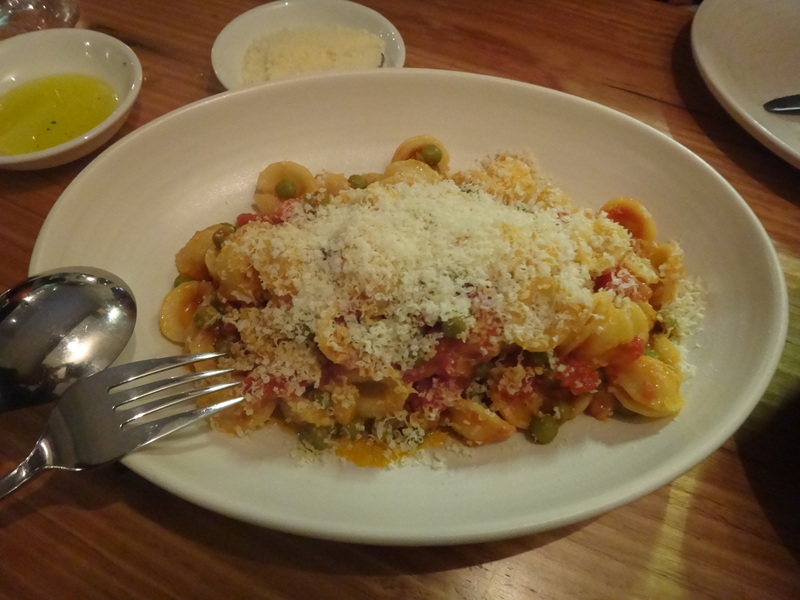 Tags: CBD, Italian, Melbourne, pasta, restaurant, review, Rosa Mitchell, Rosa's Kitchen. Bookmark the permalink.